Because of work, the frequency of use is high and special pack items purchased are saved. 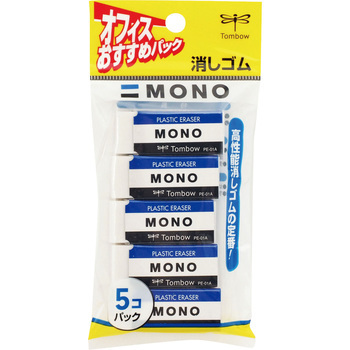 The plastic eraser has been used for a long time, especially for Mr. MONO. After all it is because it is high performance and high performance. This review is about item#6419244. · Even if you wipe it with a cloth it will not go out When the dirt is an eraser it will disappear well. The size is just right. The firmness is also good. Use it to erase what you are writing with a pencil. It was good with just ordering five sets. The cover of the eraser is an obstacle. It is easy to erase and there are few erasures and it is small so it is convenient to carry. When erasing a letter. When turning over the page. Even the letters are well disappearing and easy to use. The price also enters 5 pieces, I think that it is very advantageous in this case. I bought this because there was not enough price to free shipping. I use it because it is an eraser, I think that it was good. I misunderstood that it is one bigger one and purchased. Regrettable that there is a variation in size, it is necessary to confirm the size properly. This review is about item#06419244. With a dragonfly eraser. It is just an eraser. The price is normal. I used this item when I used a pencil. This cheapness is very good with 5 pieces. I will buy it again when it runs out. The disappearance of the pencil disappears well. Mechanical Pencil, "Tapliclip Sharp 0.5"